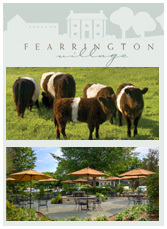 Fearrington’s 1400 acre planned community offers a variety of neighborhoods in which to build your custom home. Whether you prefer a wooded homesite, views of our Belted cows grazing in the pastures, or to be within walking distance to the village center. With miles of walking paths, an Olympic-sized outdoor pool, the Duke Center for Living, a healthy lifestyle is easy at Fearrington.